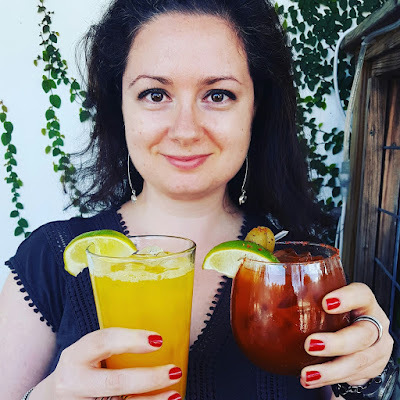 Mango & Tomato: What is your favorite wine? What's your favorite type of wine? Does it depend on what you are eating? Does it depend on the type of weather? To Anna's dismay, I prefer white wines. I like either very light and citrus-y flavors, or sweet wines, such as Gewürztraminer (if I only could pronounce it!). A while back, I assisted a wine class at Sur La Table, and was both surprised and happy to find out that the wine I liked the most out of 6 flavors was the cheapest one! What was it? It was vino verde. The flavor of this wine is sweet, but not overpowering. It has little bubbles, and tastes fresh. For some reason, I thought vino verde is only available during certain seasons (after the grapes were just harvested? ), but turns out I was wrong. When I was looking for a bottle of wine at Harrits Teeter, a store employee asked if he could help me. I said I knew the type of wine I wanted, but doubted they had it. Surprise, surprise: they actually carried two labels of vino (or vinho) verde! Just like I tend to pick books by the cover, I often select wine bottles by either the bottle shape or the label (after all, an empty bottle makes for a nice vase, and sometimes you can use the labels to make magnets). 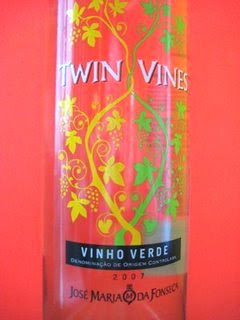 Thus, I picked this one: Twin Vines. It did not disappoint! looks really good! 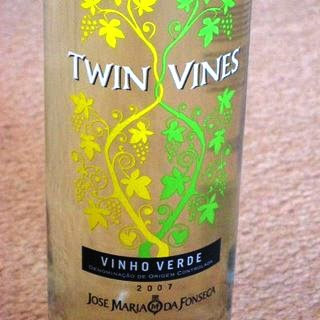 i like vino verde too! i'm a red person. what can i say?